Work From Home Warnings Internet Careers Online Review: Avoid this Scam! The Good / The sales page will teach you exactly what to avoid when looking for information on how to start a business. The Bad / They are lying about the "job" being offered. They are misleading you into believing you will be hired to work for a company, when in reality they are selling affiliate marketing training. The guarantee isn't actually guaranteed. My Recommendation / Skip this one. It's a waste of your time and money. Stick with our tried and true methods of making money online instead. There are many ways to make money online, but can I tell you a secret? There are no shortcuts! Just like in the “real world”, making money on the internet takes time, perseverance and a little luck. That’s why at I’ve Tried That we review as many systems as possible that claim to be able to make you money online easily. You see, more often than not, they turn out the be scams, or at the least not very good. Today, we have Internet Careers Online by Kelly Scott, and boy is this one misleading. For such a specific product name you may be surprised to learn that Internet Careers Online actually has nothing to do with careers. Instead it is focusing on a very specific way to make money, something they call “link posting” which I’ll explain shortly. There are also a number of red flags raised on the sales page for this product which concern me greatly and should concern you too! First off let me explain the concept of link posting. The idea is that you place links or adverts online in places like Facebook or Craigslist and when someone clicks it you earn money – or at least that’s what all the link posting scams tell you. The reality is there is no immediate payment to you when someone clicks the link; instead they need to complete an action after clicking the link, usually in the form of buying something. When they do buy something you get a commission from the sale. This is called affiliate marketing and is a legitimate way to make money online. Kelly Scott is dressing up affiliate marketing as something it’s not. She is lying about the opportunity, process, earnings, and amount of work required to get started. “Link posting” tarnishes the tried and true method of affiliate marketing. 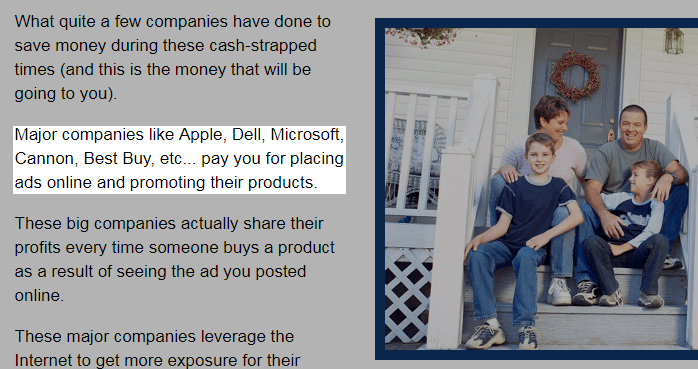 According to the sales page for Internet Careers Online big name companies like Apple, Dell, Microsoft and Best Buy will pay you to post links on the internet. They claim that the companies will pay you to do it as it’s cheaper than hiring staff. This is all utter nonsense! First off, these companies aren’t “hiring” people to place links anywhere. What you can do is sign up through their affiliate platforms and link to their website from your own. They will then pay you a commission if you send someone to their site who then buys. These companies aren’t hiring anyone. You aren’t staff. If anything, you’re an independent contractor who gets paid if, and only if, you refer a sale. The claims made by Internet Careers Online are, at best, misleading. The problem I have with link posting scams is that they all tell you to take the pre-created links and post them on Facebook, Craigslist, in forms and other social media outlets. The thing is you will be one of many people posting the same links on the same sites and you’ll all be doing it without context. What this means is that you’ll be effectively spamming. It will likely result in you being blocked, banned and labelled as a spammer depending on how vigorous you are at it. Affiliate marketing works because you create a site or a brand on social media that interests’ people and who people can trust and you promote products to them that they may find interesting. When was the last time you clicked a random link on the internet, especially in the age of malware and viruses? On the flip side, when was the last time you listened to someone you know (even virtually) who recommended a product to you? Internet Careers Online isn’t interested in whether you succeed or not they just want your money! On the subject of handing over money, the product offered by Internet Careers Online costs $97. The mantra “never pay for a job” holds true here. In this case, it looks like if you pay to sign up, you’ll be given a position where you can post links and get paid to do so. There is no guarantee that you will ever make money here. You will be paying for information. You might be thinking that I’m crazy and it doesn’t matter if you pay out the $97 because there is an iron clad 60-day guarantee. Well, I hate to break it to you but the terms suggest otherwise. The terms state that “All we ask is that you examine everything and put forth an honest effort for the first 30-days”. This is a very vague statement to make and effectively creates a loophole in the guarantee – you ask for a refund, they ask what you did to put in “honest effort” and they say it wasn’t enough so there’s no refund. I obviously can’t guarantee that this will be the case, but the loophole exists and that should make you nervous. The company supposedly behind Internet Careers Online, one Internet Careers Online, LTD (I know, inventive right? ), is a real UK company. It’s also listed as a Non-Trading company, meaning it’s dormant and inactive, and only registered back in February 2017. As it’s non trading, it should not be taking your money! Link posting scams are numerous and I should know as I’ve now reviewed dozens of them. They all follow the same patterns and none of them are legitimate. Essentially, they are selling you affiliate marketing training. Affiliate marketing is a real and legitimate business, but it is not as easy as Kelly Scott would have you believe. In the end, this one will cost you $97 and leave you with a bad taste in your mouth and no clue on how to make money online.